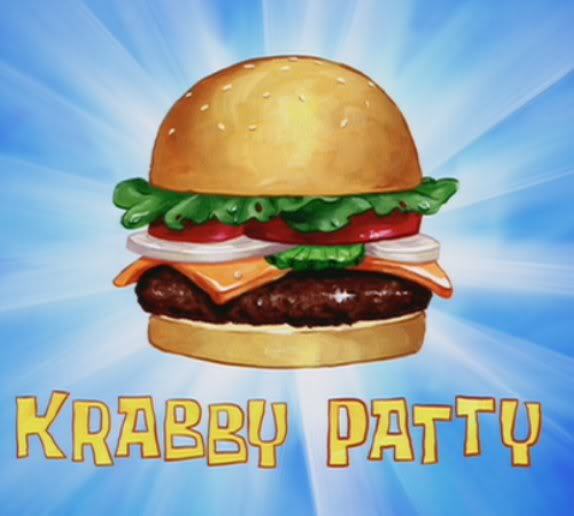 I saw a recipe for a California roll burger, and my first thought was, this is what a Krabby Patty would taste like! Perhaps minus the beef, because where would they get it from? And maybe minus the crab sticks, because wouldn’t that be cannibalism? A Sweeny Todd scenario perhaps? Let’s stop questioning a fictional burger that has no definite flavor and substance, and get down to the nitty-gritty. 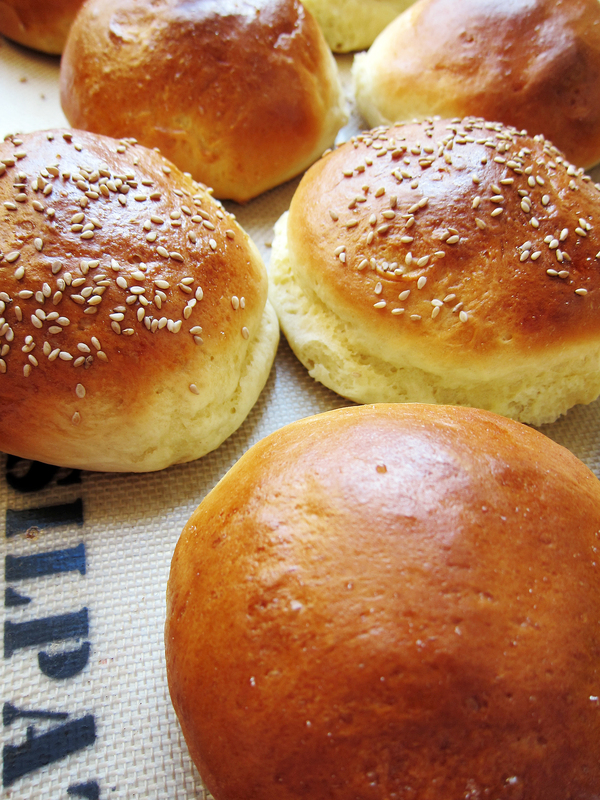 It starts with a beautiful set of hamburger buns. * Followed by a spread of Sriracha mayo, and a stack of the standard lettuce and tomato. 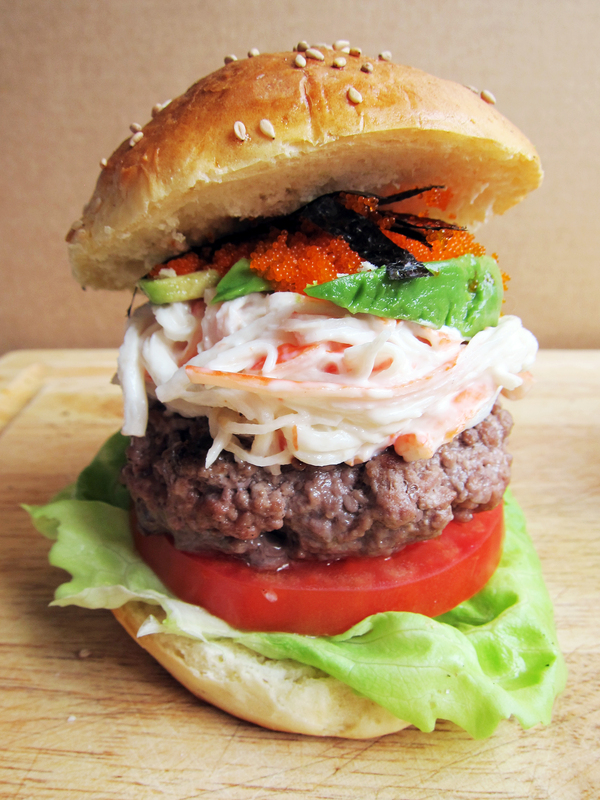 The beef has just a dash of fish sauce for the umami factor and is topped with a light crab stick salad. It is then followed by a few slices of avocado tossed in lime juice and topped with masago (smelt roe) and nori (dried seaweed). 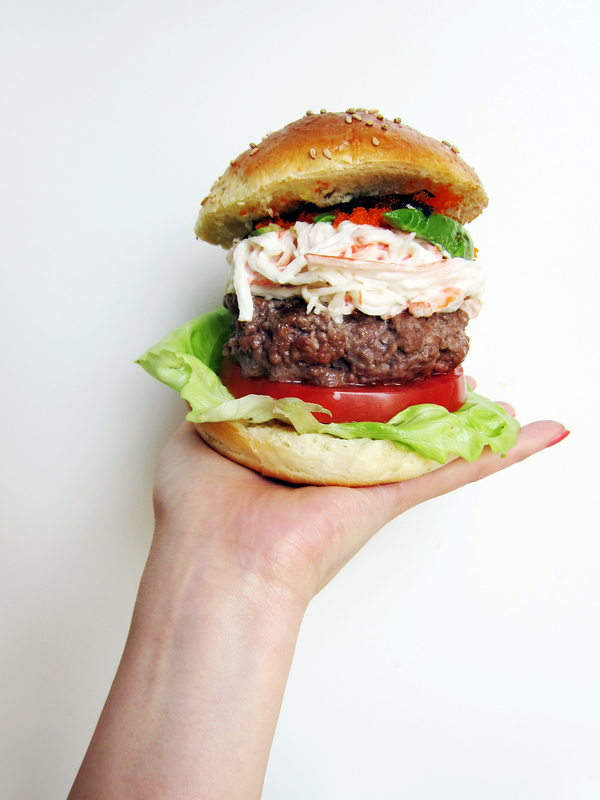 It’s bursting with flavor and is definitely a king of burgers, worthy of being flipped by Spat (Spongebob’s spatula). Mix 1 tbsp. Sriracha and 3 tbsp. mayo in a small bowl to make Sriracha mayo. Shred crab sticks and mix in 2-4 tbsp. of mayo to make the crab salad. Mix ground beef, fish sauce, salt and pepper in a large bowl. Form into 8 large patties. In a large skillet over medium high heat, cook patties about 3 minutes per side or to desired doneness. 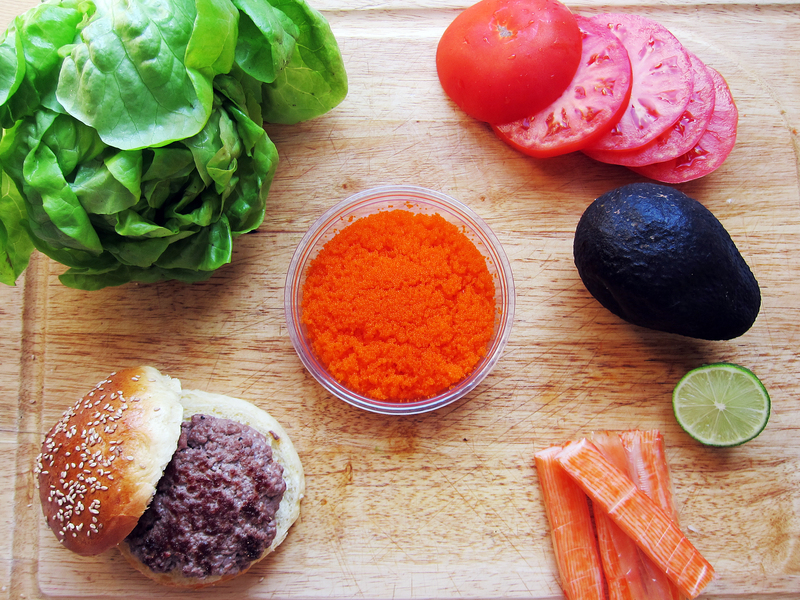 While the patties are cooking, slice avocados and toss in lime juice. 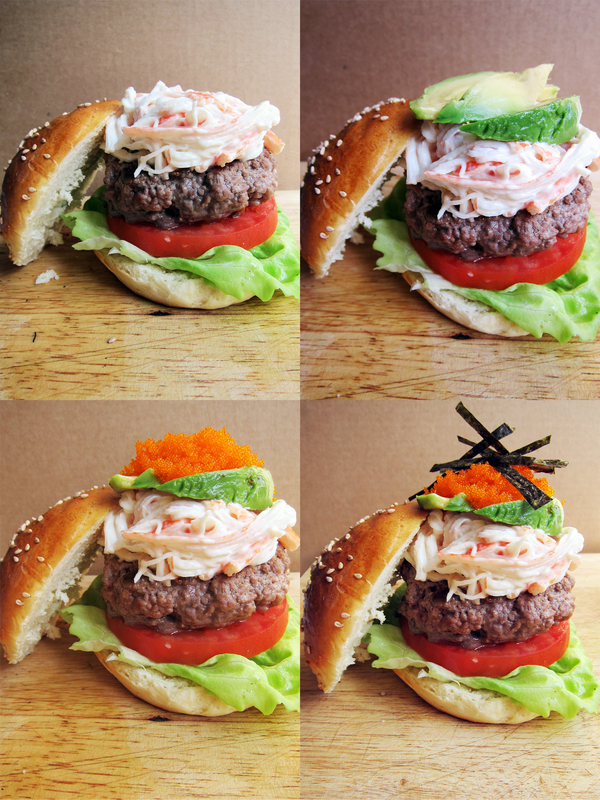 When the burgers are ready, layer the components in the following order: Sriracha mayo, lettuce, tomato, beef patty, crab salad, avocado, masago, and nori. *I made mine from scratch, but you are welcome to use store bought. These buns deserve a post of their own, and will be featured in the future. ** Recipe adapted from use real butter. This entry was posted in Beef, Bread, Burgers, Seafood and tagged bbq, beef, burgers, california roll, dinner, krabby patty, seafood, spongebob, sushi. Bookmark the permalink. Holy crap, that’s one badass burger! I hope you give it a try! The bun really makes the burger 🙂 I’ll be sure to post soon! This is epic!! You are a culinary genius and I kind of want to crawl through my screen and eat it! SUSHI AND SPONGEBOB?? I’m hyperventilating because this is absolutely awesome. This may just be the most important invention of the century.